The implementation of lean management in health care could guide health-care organizations in the improvement of performances and outcomes, lower costs, and increased patients and employees' satisfaction. Improvements and elopements resulting from the application of lean healthcare include reduced hospitalization of patients, increased patients' satisfaction, reduces patient waiting time, reduces inventory level, increased visit number of patients to their doctor, eliminating waste, reduced costs, increased quality of services and patient safety, reduced overtime of employees, mistakes and accidents, reduced patient care period, patient recovery, reduce workload, increased employee satisfaction, reduced distances, and creation of a calmer and more orderly working environment. Although health sector followed the lean services later, this thinking has been expanded in the recent years in many medical centers, and it could create significant improvements in providing high-quality services to patients and reducing costs and damages by reducing losses and wastes. This has been achieved by promoting appropriate culture and continuous improvement. This methodology lean is a methodology that tries to reduce or eliminate cost, defects, faults, inventory, space, lead times, waste and also attempts to improve and increase productivity, customer satisfaction (downstream customer, employees, and suppliers), profit, on-time delivery, capacity, quality, customer responsiveness, and cash flow. Many unknown problems and defects exist in an organization, lean methodology helps to show those problems and to create a way for improvement. The baseline of lean philosophy is changing the culture from traditional thinking to lean thinking. Comprehensive literature review on critical factors affecting the success of implementing lean concepts was conducted, an excellent leadership and the management is one of the crucial factors that drive the success of lean implementation. Implementing lean requires the effective top-down communication to provide the employee with clear objectives and consistent mission statements. Rather than working individually, successful lean implementation required cross-functional teamwork of all employees in the organization. Brainstorming and frequent communication are typically considered important ingredients of successful implementation of various improvement initiatives;, Hence, it is important that organization pays attention to communication both regarding vertical and horizontal communication. Financial capacity is a critical success factor in the determination of any successful projects. Implementing the lean initiative needs some significant investment of company in developing resources, training materials, statistical software licensing purchase, seeking consultation advice, rewards and recognition systems and others to cultivate and sustains the culture. The importance of financial capability toward the success of lean implementation can be considered regarding reward and compensation, and infrastructure considering the high degree of customer contact in services and employees play important roles in delivering valued service to customers. The highly skilled labors of the organization are important to ensure company growth and success. Hence, it is necessary that service company pays more attention to skills and training for an employee to achieve the goal of lean implementation. With this regards, three dimensions, about the skills and training, include employee sufficiency, employee training, and employee learning. Organizations have little chance of successfully implementing lean unless paying attention to culture. Stated that the creation of supportive organizational culture is an essential platform for the implementation of the lean concept. Antony and Banuelas agreed that successful implementation required adjustments of organizational culture and changes in employee attitude. Mentioned that collaboration is required to achieve and sustain the success of lean implementation, considered critical success factors for lean adoption, toward the cultural implications. Overall, it is imperative that the organization considers important aspects of cultural factor, including openness, collaboration, receptivity, and data sharing. In this study, to develop an initial and conceptual model of research, the related literature and research at home and abroad were reviewed, and the success key factors of lean management and its challenges and lean management techniques and tools that can be used in the field of services, especially hospitals, were identified. This was a correlation descriptive study. The study population included all employees of public hospitals in Kohgiluyeh and Boyerahmad and Bushehr provinces. Using single-stage random cluster sampling, 500 of people were selected among population of the study. Among all public hospitals of Kohgiluyeh and Boyerahmad and Bushehr provinces, ten hospitals were selected randomly, and questionnaires were delivered to staff of these hospitals to respond to them. To collect data, a researcher-made questionnaire was used that contains 60 items and 7 subscales (human dimension, technology dimension, management dimension, improved quality dimension, process management dimension, communicative dimension, and structural dimension). Responses were scored based on five choice Likert scale from very low (0), low (1), moderate (2), high (3), and very high (4). The questionnaire was developed based on the research objective and its theoretical framework. After developing the questions and their subscales, questionnaire was delivered to three experts in the field of lean management to investigate its content validity. Content validity of the questionnaire was approved by three experts after reviewing. The Item-Objective Congruence (IOC) used to measure the validity of questionnaire is the process where content expert's rate individual items on the degree to which they do or not do measure specific objectives listed by the test developer. The context experts will evaluate each item by giving the rating of 1 (mean clearly measure); -1 (mean clearly not measuring); or 0 (mean degree to which it measure the content area is unclear). The IOC form of this study was presented to three experts to evaluate. The items which IOC rate >0.75 are considered valid and the items which IOC rate <0.75 are required to be revised. IOC forms were sent out for experts to evaluate the validity. The IOC index of all constructs, which include leadership and management, communication, financial capability, skills and expertise, organizational culture, and lean implementation success, is higher than 0.75, represented the high validity of survey instrument. After confirming the validity of the questionnaire, to determine construct validity, exploratory factor analysis was used. To implement exploratory factor analysis, the quality of the correlation matrix of questions and the content sampling capability of the questionnaire were evaluated. Kaiser-Meyer-Olkin coefficient was equal to 0.88, which implies that the information contained in the data matrix is significant and the sample size is satisfactory [Table 1]. Based on the results of exploratory factor analysis using principal components analysis method and varimax rotation, six factors with eigenvalues >1 were extracted explaining 64.54% of the total variance explained of scale. Confirmed factors in terms of variance percentage of eigenvalue include, respectively, human dimension, technology dimension, management dimension, improved quality dimension, process dimension, communicative dimension, and structural dimension. These findings confirmed the construct validity of the management model dimensions of theb questionnaire. In addition, to examine the reliability of this instrument, Cronbach's alpha coefficient was obtained as follows: reliability of coefficient of human criterion (0.86), technology criterion (0.89), management criterion (0.92), process criterion (0.86), communicative criterion (0.88), and structural criterion (0.80). The total reliability of the instrument was obtained 0.95 using the split-half method. Five hundred participants participated in this study of which 50.2% were female and the rest were male. About 49.2% were between 41 and 50 years old. Nearly 25.2% of the participants had graduate studies, and organizational position and 37.8% of them had undergraduate studies. After the factor analysis and varimax rotation, six factors were identified. [Table 2] shows the total amount of explained variances by these six factors. [Table 2] shows the eigenvalues and the variance associated with the factors. Eigenvalues for each factor are a proportion of the variance of total variables which are explained by that factor. Based on [Table 3] results, research items are divided into six factors that the first factor explains 19.54% of the variance, the sixth factor explains just 6.46% of the variance, and in total, these six factors explain 58.57% of the variance. As can be seen in [Table 3], the management factor had the highest response with an average of 32.53 and standard deviation of 7.011, and the process factor had the lowest response with an average of 13.34 and standard deviation of 5.13. Correlations between critical factors are examined. [Table 4] shows the bivariate correlation between the five independent variable factors. There is some relationship between factors. The correlation coefficients were generally between 0.3 and 0.4 and all factors seem to be related to the other factors. This indicated that firms which are advanced in their practices on some factors tend to be more advanced on others. The relationship between critical success factors and lean implementation success was analyzed using multiple regression analysis. The multiple regression model was statistically significant (significant level = 0.05). The F value was 32.51 and P < 0.001 indicated that the critical success factors have a positive influence on the success of lean implementation. [Table 4] shows the result of the multiple regression of all six critical factors regressed on the dependent variable lean implementation success. [Table 5] displays the multiple regression of all six critical success factors regressed on the success of lean implementation. Factors contributed to the success of lean implementation are presented. Results revealed that human criterion, technology criterion, management criterion, process criterion, communicative criterion, and structural criterion have a significant relationship with the success of lean implementation. [Table 6] as the results of fi tting the model. The set of fitting indices shows that these data are fit for fit, so they have the ability to measure this structure in [Figure 1], indicating fit appropriate for this model, which has been approved. Although [Figure 1] in the approved model of lean management for improving the quality of service of government hospitals, it has been determined that the technology factor has the highest regression weight in the overall model, which indicates its importance in forming the model. After the technology factor, the highest weight belongs to the process, contact, structural factors, human, and management factors, respectively. The paper reviewed and identified critical factors enabling to the success of lean implementation in service operations and six critical success factors were identified including human, technology, management, process dimension, communicative, and structural dimension. The aim of this paper was to examine these critical success factors and the success of lean implementation in Kohgiluyeh and Boyerahmad and Bushehr provinces. Dataset collected during 2016 was analyzed using multiple linear regression. 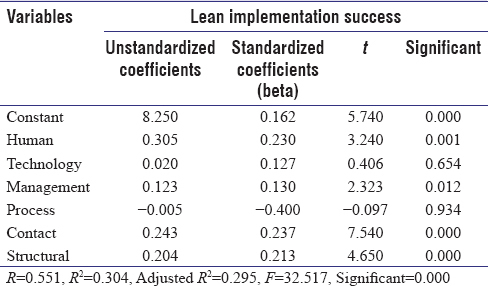 The key statistical finding suggested that there is a significant relationship between some factors to the success of lean implementation. These critical success factors included leadership and management, human, technology, process dimension, communicative, and structural. In summary, this study helped in broadening the literature related to critical success factors in a particular context of general hospitals. In this study, after exploratory analysis to review the fitness of the conceptual model with the collected data, the confirmatory factor analysis was used. Proposed model of research has been fitted in all aspects of fitness. This means that the data and experimental model are consistent with each other and the data support the experimental model. Finally, the results show that of the seven factors identified in lean management model, the technology factor with a coefficient of 0.953 has the highest impact, and the management factor with a coefficient of 0.615 has the lowest impact lean management model. Therefore, it can be said that the findings of this study are in line with.,,,,, All these researchers found that lean management improves service quality, and in their review, they more study human and contact dimensions of lean management. About the impact of technology factor in lean management model, we can refer to Ker et al., study. The result of their research highlighted the impact of lean technology factor in the improvement of hospitals service quality and waste reduction and by selection of digital scanning technology showed a significant reduction in time processes. About the impact of management factor on the improvement of the quality of public hospital services,,, emphasized the importance of management factor and its impact on improving the quality. These researchers concluded that the increase in the relationship among employees and the relationship between employees and management would be the benefits of lean implementation. Clear and effective relationship as one of the success factors in the application of lean management in the service sector is helpful for providing staff feedback for the manager to improve the quality. Finally, the findings showed that there is a positive and significant relationship between lean process and structural factors with the improvement of quality, and two factors of process and structure have a direct impact on the improvement of quality. In this regard, also emphasized the changes in the processes and structures for easier understanding of them which will motivate employees and improve the quality. Sarkar stated that identifying the processes in the service sector is very hard because they are not as obvious as processes in the manufacturing sector. Moreover, because of size and complexity, it is difficult for organizations to deal with processes to minimize waste. Therefore, processes must be registered consistently to keep track of performance. According to what was said above, lean management is a very important concept because it requires broad understanding, high commitment, and depth analysis of the problem. In the long term, many organizations used lean to improve quality, reduce costs, and provide faster service. To be successful in the application of lean management in public hospitals, the existence of a committed manager to support the organization and participation and commitment of all staffs is necessary. Lean management focuses on identifying the root of the problems to prevent their recurrence. Its success is the result of the participation of all levels of managers and staff, organizational structures and procedures, and the use of new technologies. 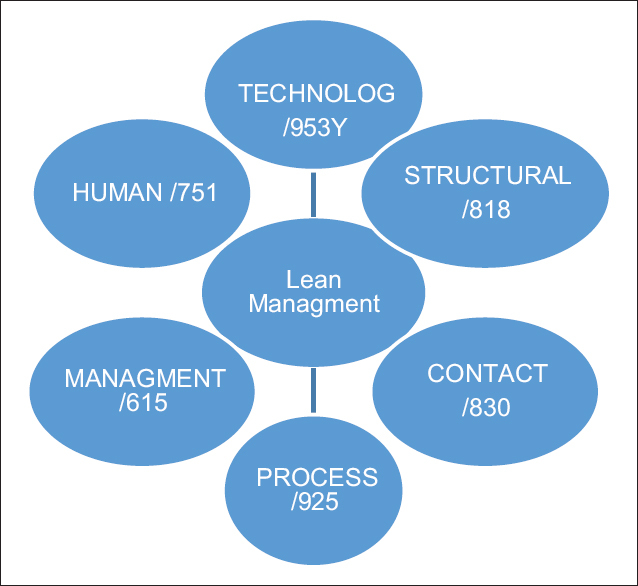 Understanding these factors before implementing lean will help to realize its benefits and also to create a lean culture. Black J, Miller D. The Toyota Way to Healthcare Excellence: Increase Efficiency and Improve Quality with Lean. Chicago, IL: Health Administration Press; 2008. De Souza LB. Trends and approaches in lean healthcare. Leadersh Health Ser 2009;22:121-39. Achanga P, Shehab E, Roy R, Nelder G. Critical success factors for lean implementationwithin SMEs. J Manuf Technol Manag 2009;17:460-71. Cuatrecasas Arbós L. Design of a rapid response and high efficiency service by lean production principles: Methodology and evaluation of variability of performance. Int J Prod Econ 2002;80:169-83. Staats BR, Brunner DJ, Upton DM. Lean principles, learning, and knowledge work: Evidence from a software services provider. J Oper Manag 2011;29:376-90. Jeyaraman K, Teo LK. A conceptual framework for critical success factors of lean six sigma implementation on the performance of electronic manufacturing service industry. Int J Lean Six Sigma 2011;1:191-215. Bhasin S. Measuring the leanness of an organization. Int J Lean Six Sigma 2011;2:55-74. Bhasin S, Burcher P. Lean viewed as a philosophy. J Manuf Technol Manag 2006;17:56-72. Antony J, Banuelas R. A strategy for survival. Manuf Eng 2001;80:119-21. Dahlgaard JJ, Dahlgaard-Park SM. Lean production, six sigma quality, TQM and companyculture. TQM Mag 2006;18:263-81. Sheikhi S. Designing a Model of Lean Hospital and Comparing it with the Selected Processes of Kashani Hospital in Shahre-Kord. Research Project, Centre of Studies and Standards Codification; 2013. Bani Asadi M, Vatan Khah S, Agha Hosseini F. Measurement and analysis of the quality of hospital services using the importance-performance analysis tools of patients' view in selected public hospitals of Tehran. Fac Health Med Res Inst 2013;11:35-46. DiGioia AM 3rd, Greenhouse PK, Chermak T, Hayden MA. A case for integrating the patient and family centered care methodology and practice in lean healthcare organizations. Healthc (Amst) 2015;3:225-30. D'Andreamatteo A, Ianni L, Lega F, Sargiacomo M. Lean in healthcare: A comprehensive review. Health Policy 2015;119:1197-209. Farjam A, Farjam S. Checking the quality of provided health care services in university hospitals in Isfahan based on servqual model. Approved Projects in Isfahan University of Medical Sciences; 2010. Globenko A, Sianova Z. Service Quality in Healthcare Quality Improvement Initiatives Through the Prism of Patient and Providers Perspectives, Master Thesis, Umea University; 2012. Ker JI, Wang Y, Hajli MN, Song J, Ker CW. Depioying lean in healthcare: Evaluating information technology effectiveness in U.S. hospital pharmacies. Int J Inf Manag 2014;34:556-60. Abdullah MM, Uli J, Tari JJ. The influence of soft factors on quality improvement and performance: Perceptions from managers. TQM J 2008;20:436-52. Atkinson P. Creating and Implementing Lean Strategies. Manag Ser 2004;48:18. Cotte P, Farber A, Merchant A, Paranikas P, Sirkin HL. Getting more from Lean. BCG Publication. Available from: http://www.bcg.co.jp/documents/file15326.pdf. [Last retrieved on 2010 Oct 15]. Sarkar D. Challenges of Service Lean Implementation. Six Sigma IQ; 2009. Available from: http://www.sixsigmaiq.com/columnarticle.cfm?externalid=681&columnid=15. [Last retrieved on 2010 Oct 05].